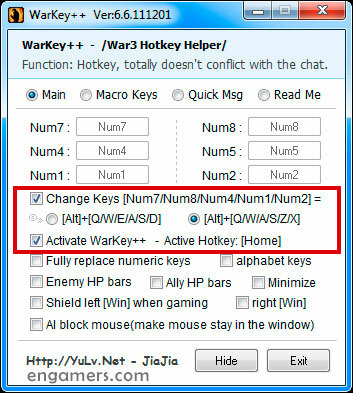 Warkey ++ is a utility that allows you to custom and configure your HotKeys of your DotA inventory, as well as the skills of your heroes of DotA 1, adapting your characters to your best style of game, in order to get a better an performance and efficiency during your matches. The program supports the latest version of warcraft 3, and DotA maps such as DOtA 6.88w9.4, the latter very popular in the online platform RGC (Ranked Gaming Client). The program has a very intuitive environment that does not affect the chat system (it can automatically disable the program when typing) and its simplicity makes it a very easy to use HotKey, it also supports a variety of gaming platforms, such as Garena, RGC, PvPGN Servers, Battle.net, among others. – Tworks with the maps DotA 6.88×3, 6.88w9, 6.88v7, DotA 6.88v3, 6.88u, DotA 6.85k and others maps. – Works with Garena, RGC and other platforms. – Supports Warcraft III The Frozen Throme 1.28, 1.27b, 1.27a and latest versions. – Copy WarKey.exe file in your main warcraft folder…- Run the WarKey.exe file as administrator (right-click, and click “Run as administrator”)…- The program’s icon now appears in the clock bar. – click it with the right mouse button, select “Main Interface”, and custom your hotkeys. – check the box “Change Keys”, and select your customkeys favorite, ALT + Q/W/A/S/Z/X or ALT + Q/W/E/A/S/D, now check the box “Activate Warkeys++” and, click on “Hide”. – If you wanna Customize you DotA Skill, select the “Macro Keys” menu, and Customize your Hotkeys, and “Hide”. – Now Start Warcraft III Game, and Test your Hotkeys.